My best friend Shannon has this frustratingly positive effect on me. Following her lead, I’ve adopted some annoying and time consuming habits over the years – flossing nightly, wearing SPF bazillion sunscreen even indoors and worst of all…running. In fact, she tricked me into running both a full, and then another half, marathon in 2008 when I could barely eek out a mile without wheels on. She’s lucky I keep her around. Since then, I managed to survive a few years run-free and turned to other, more enlightening activities like wine tasting, cupcake baking, and couch potatoing. But just last month, Shannon used her healthy ESP to convince me to run another race. So in January, I shall be one of thousands of women donning a lime green fairy getup at the Tinkerbell Half Marathon at Disneyland (insert magical tinkling noise here). Wine is recommended: There are many milestones involved in marathon training – the first time you complete a long run without stopping, the first time you clock your fastest mile, the first time you get a chafing rash on your inner thighs – these moments must be celebrated. Rule of thumb: your ounces of wine per week should directly correlate to your mileage. You get to play with toys: It was essential that I buy myself a new iPod, Garmin heart rate monitor and a Fitbit in order to properly train – just like the cavemen used to do. You’ll get lots of pedicures: Long running stints equal swollen feet, calluses, and bruised toenails. Your feet will need lots of love. Tip well. Snacks are now called “fuel”: You’re burning about 100 calories per mile (80ish after you account for the wine). This deficit can be used for all kinds of fun things. My running group swears that gummy bears, peanut butter filled pretzels, cookies and granola bars are all appropriate training “fuel” and have them waiting at the end of every long run. Laziness is required: Every Friday my little running schedule says “rest day.” I take this day very seriously. This is a day for elevators, pizza delivery, and twist off wine bottles. It’s for a cause: Whether or not you can get your race mojo going, running for others is always inspiring. 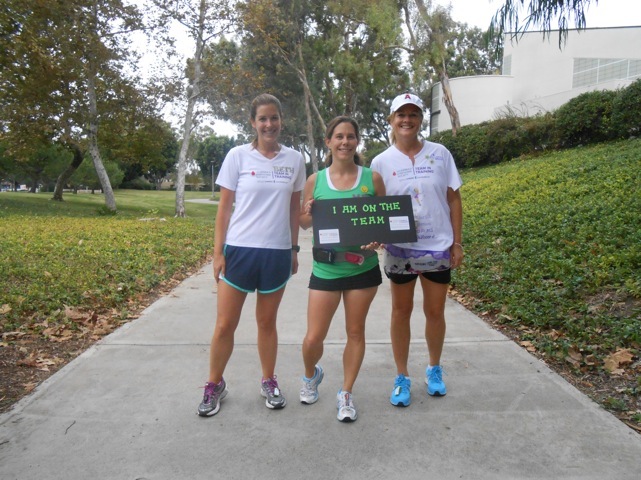 I’m running with Team in Training to raise money for the Leukemia & Lymphoma Society. Pick a cause that matters to you so when you’re exhausted after an eight-miler, your toenails are black, and someone just ate the last gummy bear, you’re still on a runner’s high. I’d love to hear any tips you have to stay motivated! I'm an 80s music lover, traveling junkie, mac & cheese connoisseur, amateur wine snob, party-planning priestess and Chicago transplant living in Southern California. I find adventure in the everyday and have a unending compulsion to write about it. Hope you enjoy reading my mind! This entry was posted in Commentary, Fitness, Friends, Health, Humor, Life, Travel and tagged disney, Disneyland, half, marathon, running, Tinkerbell, training, wine. Bookmark the permalink. Thanks so much! I’m a Tink girl. Maybe I should do my research though..
And the OK is yours. I recommend white – it gives the impression of being more hydrating. Good tips! I’m trying to build up my tolerance for running. It’s coming along… Slow and steady. Slow and steady is the way to go. Hang in there. I truly could not run a full mile before I started. Best of luck! I have always enjoyed your posts and in the past I felt that it was, somehow, my responsibility to comment with some smartass response that you have always fielded in the same good humor that mine was intended. Today is different. Simply put, I admire and congratulate you for your participation in the running event you have identified. Not only because it’s a very worthy cause, which it is, but because you and your running mates are doing yourselves a great service that is going to become more and more evident as you (gasp) get older. Me, I’m ancient, with health issues that are not important here. What is important is that I can tell you from experience that physical activity, good ‘ol strenuos heart pumping activity, is the best way to continue an active lifestyle when you are (second gasp here) ancient like myself. I have friends who have been dedicated couch potatoes over the years, some smugly so, that are now house bound. I’ve been a gym rat for many years and loved to travel. I still can. So keep on keepin’ on. This made my day 🙂 Thank you for the well wishes, advice and moral support. finished my first half in 2011, I think I’ll stick with halves from now on. NO full marathons for me. My knees wont like it. I concur. It was a nice box to have checked, but that’s all she wrote! I’m king of the rest days. I’m happy to take rest tips from the official King! I’m in the i Hate to rin category…:) I was wondering if you could check out my blog. Come and see a kid’s view on all things baseball. Feel free to offer any advice and to pass it along. Ha! I super love this post! So many benefits to running! Oy vay.. I have a similarly influential ‘friend’. After claiming that I would never run either than if it was towards the fridge to get a beer, or away from something chasing me – I’ve completed three 5k races, run 10k a few times (not in a sanctioned race however) and have an 8k race tomorrow morning. at 9am on a Saturday. What. The. Hell. I LOVE THIS POST. I’m planning on running a half marathon before I turn 30. Right now I’m working on the CouchTo5k plan, then 10k version, then a half marathon! I also love “fuel” AKA wine and baked goods!! I would find the prospect of running in a lime green getup under the moniker “Tinkerbell” uber-motivational! My one tip would be go easy on the pixiedust at first. That’s going to be an amazing run! Sweet payoff too what a great time of year to be in the South of France. Love #smugsaturday.